A couple of years ago I read Say Goodbye by Lisa Gardner. *shudder* It had to be one of the freakiest books I’ve ever picked up—and devoured. Now anyone who has talked to me for at least ten minutes discovers that I hate spiders with a passion usually reserved for hot dreams starring Vin Diesel. When we were younger, my sister and I stapled the spider section in the Encyclopedia Britannica together so we wouldn’t flip to it by mistake. When we moved into our house eleven years ago, I spied this huge spider—yes, it was huge!—in the basement. And I haven’t been down there in, let’s see…one, two three…yeah, eleven years. Yup, it’s that deep. I reveal all this seemingly random information for a purpose. It just so happens that Say Goodbye is about a serial killer who does women in with spiders. Even now, I don’t know how I made it through that book with her detailed descriptions of Brown Recluses (did I spell that right? I don’t know, but I’m not Google-ing it to find out! ), Black Widows, and every kind of tarantula possible! But what kept me reading like strawberry cake awaited me on the next page was the villain. Freaky. Creepy. Scary. Disturbed. Did I mention FREAKY?? I finished the book a couple of years ago, yet the villain still haunts me. Now that is the earmark of a damn good bad guy! As writers, it’s so easy to make our antagonists evil because…well, just because they’re villains and they’re supposed to be evil. *raising my hand and waving madly* I’ve so done that in my writing life time. But I’ve discovered that the most interesting, compelling, and memorable villains are three dimensional. They have layers. Lisa Gardner’s villain contained all that and then some! An antagonist should have a history just like the hero and heroine. I need to know what makes him tick. What is his motivation? Even if it is completely irrational, I want to get into his head and be a visitor in his crazy mind. I mean, if he kills women who wear Betty Boop t-shirts because she was his wife in a former life and she left him for another man, I want to read how he rationalizes that! Also, he needs to be scary intelligent. I mean, really, if Barney Fife could nab him with that one bullet in his pocket…I ain’t buying it! In order to be pitted against the hero and heroine he definitely cannot be too stupid to live! And, oddly, I need to be invested in him as much as I am in the main characters. He should have a stake in the story, and I want to care about whether he reaches his goal or not. Lisa Gardner created a character that was so evil, so devoid of human empathy and emotion, it terrifies me that someone like him may actually exist out there. Yet his past, the pain and horrible abuse he endured caused me to actually feel for him—even though I wanted him to die. How conflicted is that? And I still think about him…I still ache for him, a fictional character, even as I feel just a bit safer that he’s dead. Have I been drawn in to that story, or what? What makes a memorable, perfectly evil and haunting villain for you? Share with me! 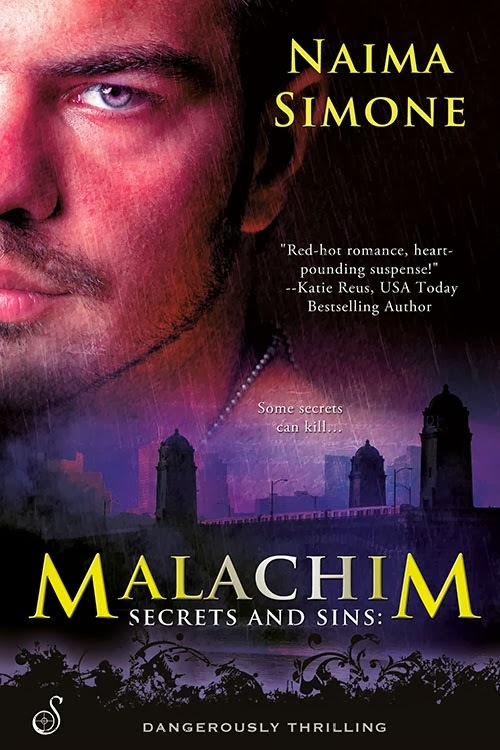 To celebrate the release of Secrets and Sins: Malachim, Book 2 of the series, September 23rd through October 4th, you have a chance to enter a GIVEAWAY for a $20 Amazon Gift Card, a World Traveler Boston cuff bracelet, and the 4 September Ignite releases! 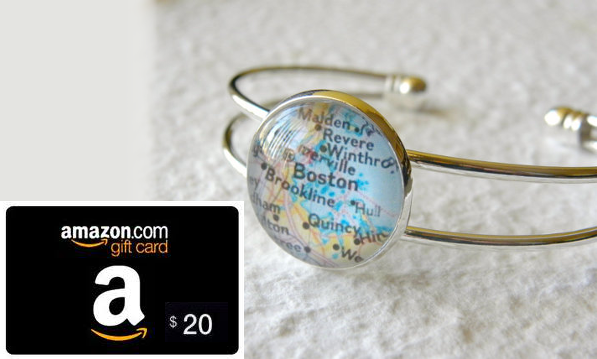 You can enter through the Rafflecopter below! 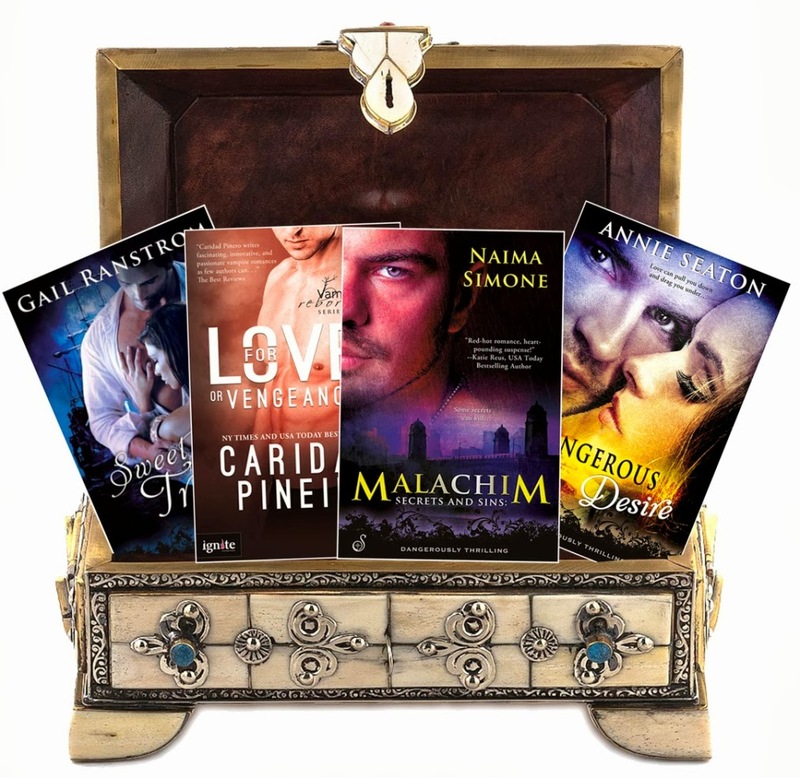 Thank you so much, Just Romantic Suspense, for letting me blog with you today! It was such a pleasure! Oh, Malachim heard so much in that slight hesitation. At some point in her life, those sworn to protect and serve had failed her. She didn’t trust cops. Suddenly, her vehemence about not calling the police after the mugging made sense. Through the years, he’d had clients who’d had troubled pasts and possessed an inherent dislike for anyone with a shield pinned to his or her chest or carried in a wallet. While her reply assuaged some of his questions, it didn’t answer all of them. What had occurred to instill her mistrust? Was it related to the fear of men she tried—and failed—to conceal? Another pause, and the skin over her knuckles blanched. He exploded from his chair. The piece of furniture teetered before rocking forward, the front legs hitting the floor with a thud. He noticed her flinch, but he could do nothing to reassure her. Not while fury raced through his veins. He stalked from the room and entered the kitchen. He didn’t want to scare her with his rage. Because part of it was directed at Danielle. Why hadn’t she said something earlier? The home invasion, the shooting, her narrow escape… Suddenly, the robbery-gone-wrong had taken on a darker, more sinister cast. One where she, not her belongings, had been the primary target. Naima, I really like your take on writing a villain and making him/her three dimension and getting in their head, even if they are irrational. Your book sounds great, can't wait to read! I'm a fan of Lisa Gardner. I'll have to find the book you refer to here - spooky! You sooo won't be disappointed, Cheril! Oh wow. Lisa Gardner is an amazing writer, and she just out does herself with this one. And did I mention I have a paralyzing phobia of spiders? :-D That's how good this books was--I read it anyway. Thank you so much for coming by, visiting and reading! Have an awesome day, Cheril! This book looks so good! can't wait to read it. Awesome! Thank you, Angela! I hope you enjoy it. 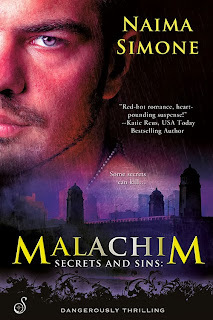 I might be a tad bit biased--just a tad bit, mind you--but Malachim's book is one of my favorites. I am hooked from your perspective on the villain alone! and then the excerpt has captivated me. Your book is definitely on my read list! Cool! I'm glad I could introduce you to a new book. Let me tell you, you will not be disappointed with Say Goodbye. Aaand I'm just gonna go out on a limb and say you won't be with mine either. LOL! Thank you for coming by, taking the time to read and comment! You rock! 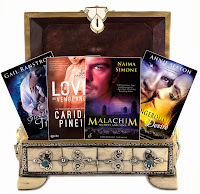 Enjoyed reading your post today... What would suspense be without the villains... there have been a few that really got to me... how the authors were able to bring such evil to life... but what I love most is the HEA for the hero & heroine. Thanks for stopping by today and giving me your time, Colleen! Have an amazing Thursday! Oh it is! I couldn't put the book down. And that's saying something considering the weapon of choice. :-D Thank you for coming over, reading and commenting! I think I'm in for a great read. Villain. Please enter me in your draw.